The storm that caused the loss of the C G White is referred to as “the great Easter gale of 1895”. The below lists of passengers and crew of the C G White was compiled from a number of publications. Names crewmembers names were often spelled differently from one news story to the next. Abbreviations for the sources of names and other information are put with each of the names for clarity. Hunter Charles Haritwen (PCN-7) “Long Charlie” Hartmen died of exposure on beach (EBPL) (SFC-14) Long Charlie was a pioneer in the fur trade and had been captain of the sealing schooner Louisa D.
First Officer Chris Swendson (SFC-14) Limbs amputated at Kodiak Wood Island. Thomas Hansen (EBPL) was washed overboard but thrown back by another breaker. C L ANDERSON (1964) The 95 ton 71 foot wooden oil screw State of Alaska fishing vessel C L Anderson was destroyed by a storm March 25, 1964 at Kaline Rock, Kodiak Island. C LIUN (1988) The 32 foot vessel C Liun was consumed by fire October 20, 1988 in Larson Bay. C P #4 (1938) A small motor craft identified as C P #4 was lost at Kenai August 28, 1938. C P #12 (1938) The 26 ton 51 foot wooden scow C P #12 stranded and was lost at the mouth of the Kenai River August of 1938. There was no one aboard and no lives were lost. C P P C #1 (1924) The 22 ton wood scow CPPC #1 was lost at noon on Thursday September 4, 1921 at Point Gord. She was loaded with 10 tons of salt, barrels and equipment bound for Horseshoe Bay having departed Red Fox Bay on September 3rd. Her tow line parted in a storm that arose after the start of the voyage and she blew out to sea. The CPPC #1 was valued at $1,000 as was her cargo. C R P NO 4 (1945) The 33 ton 55 foot wooden scow C R P No 4 foundered March 8, 1945 in Prince William Sound. C STEWARD (1926) The unmanned gas screw C Steward was at anchor at Chignik when it broke up and was abandoned April 1, 1926. It was reported to have no value at the time of the loss. C-S-F (1951) The 70 ton 63 foot steel oil screw fishing vessel C-S-F stranded and was lost May 14, 1951 at Leonard Island near Cold Bay, Bering Sea. CAJUN MAMA (1992) The 71 foot fishing vessel flooded from the stern, capsized and sank May 26, 1992 approximately 30 nautical miles SSW of Cape Cleare. High seas and 40 knot winds contributed to the disaster. All five on board were rescued by a U S Coast Guard Helicopter. CALISTA SEA (1982) The 108 foot crab fishing vessel Calista Sea sank January 20, 1982. The vessel began taking on water near the Shumagin Islands. She was under tow by the vessel Polar Shell on the way to Kupreanof Harbor when the disaster occurred. The six persons aboard the Calista Sea were picked up by the fishing vessel Patricia Lee. CAMELOT (1982) The 34 foot fishing vessel Camelot capsized and grounded in heavy weather May 22, 1982 near Hinchinbrook Island 25 miles southwest of Cordova. Richard T Hinde was lost. CAMILLA A (1909) The American wooden scow Camilla A foundered in heavy seas and became a total wreck at 9:00 p.m. on June 15, 1909 at Chignik Bay. She was being captained by Adam Kerz of LaCrosse, Wisconsin with the help of one crewman. The vessel left Cordova on June 11 bound for Saint Michael; no cargo. The steamer St. Helens assisted in towing the Camilla A into a harbor. The crew was unharmed. CAPE BARNABAS (1964) The 10 ton 29 foot wooden gas screw fishing vessel Cape Barnabas was destroyed by a tidal wave March 27, 1964 on Kodiak Island. CAPE CHACON (1987) The 44 foot seiner Cape Chacon capsized and sank June 19, 1987 approximately 50 miles south of Montague Island. A U S Coast Guard helicopter picked up three of the crewmen from a life raft. The fourth crewman, Tom Banks of Kodiak was lost. CAPE CLEARE (1988) The 51 foot wooden long line fishing vessel Cape Cleare foundered April 8, 1988 approximately 35 miles south of Kodiak. Five of her crewmembers abandoned ship to a life raft when she began taking on water. A sixth was pulled from the water by a U S Coast Guard Helicopter. There was no loss of life. CAPE FAIRWELL (1982) The 72 foot fishing vessel Cape Fairwell ran aground, overturned and was lost January 12, 1982 north of Mitrofania near Chignik. The four person crew was picked up by the Aleutian Spirit and transferred to the Polar Shell. CAPE KARLUK (1947) The 15 ton 32 foot wooden gas screw fishing vessel Cape Karluk burned June 21, 1947 off of Kumlik Island. CAPE KARLUK (1964) The 12 ton 31 foot wooden gas screw fishing vessel Cape Karluk was destroyed by a tidal wave March 27, 1964 at Shearwater Bay. CAPE KARLUK (1988) The 32 foot fishing vessel Cape Karluk was destroyed in a storm January 12, 1988 in Geese Island Channel. All three on board were lost including Merle P Ashouwak (24), Jerry D Christiansen (30) and Eugene Naumoff (34), all from Old Harbor. The vessel was seeking shelter in Russian Harbor from 40 to 60 knot winds. CAPE SPENCER (2010) The 47 foot fiberglass fishing vessel Cape Spencer foundered May 20, 2010 three miles south of Montague Island in Prince William Sound. The vessel reported she had a flooded engine room and was in danger of sinking. All four crewmembers abandoned ship in survival suits to a life raft and were rescued by a U S Coast Guard Jayhawk Helicopter from Cordova and transported to Seward. The survivors included owner operator Thomas Tomrdle (61) and his son Thomas Tomrdle both of Kenai as well as James Hilala (70) and Jeremy Sullivan (34) both of Whittier. At the time of the sinking winds were 28 miles an hour with seas to six feet. CAPE UGANIK (1969) The oil screw Cape Uganik was destroyed by a storm June 7, 1969 in Kanatak Lagoon. CAPE UYAK (1986) The 34 foot fishing vessel Cape Uyak was gutted by fire October 22, 1986 at the Channel Transit Float in Kodiak. Lost in the fire was John F Connery (18) of Raymond, Washington. Connery had apparently died of carbon monoxide poisoning. The fire was determined to have originated in the galley. CAPELLA (1980) The 85 foot steel crab fishing vessel Capella rolled over and sank March 29, 1980 between Deer and Fox Islands near King Cove. Four of her five crewmembers were lost in the disaster. Lost were skipper Ogie Berg (40), his older brother Dagfin “Finney” Berg (45), Robert J Connelly (45) and Jack Fink. Scott Pickering of Seattle was the lone survivor. The vessel had run onto a rock off Cape Lazaref late in the evening of March 27 during heavy weather. Damage was done to the Capella’s lazarette and rudder. Early the following morning the Capella was able to communicate her distress to the tanker Alaska Standard. A tow was initiated using the anchor tackle of the Capella. A storm set in and the Alaska Standard decided to seek shelter at the Fox Island Anchorage with the Capella tethered by her anchor tackle. Winds were at 50 knots and seas 10 to 15 feet. Just after 1:00 the morning of March 29, 1980 the Capella capsized and sank. Sources: 1. Unofficial Wreck List (Kodiak), 2. BOEM Alaska Shipwreck List (2011), 3. The Seattle Times (March 31, 1980) “Survivor of capsizing identified” Pg D-3, 4. The Seattle Times (April 1, 1980) “2 Seattle brothers among drown victims” Pg E-18, 5. Merchant Vessels of the U S (1979) Pg 245, 6. Berg v. Chevron U.S.A. INC.
CAPRICE (1999) The 68 foot steel fishing vessel Caprice flooded her engine room and sank at 2:30 a.m. June 6, 1999 approximately 11 miles southeast of Nuka Island in the Gulf of Alaska. The vessel was travelling from Seward to Kodiak at the time of the disaster. Severe flooding was noted aft of the reduction gear just after midnight. All four crewmembers donned survival suits and abandoned ship to a life raft two hours later. They were rescued by the fishing vessel Kaia. The Caprice had run aground a month before near False Pass when a crewmember fell asleep at the helm. A cursory condition and valuation survey was done at the Seward Shipyard after the grounding but no abnormalities were noted. Additional Information: ON 565511, Built 1975, Former Name Credence, Call Sign WYP6558, Owner Nordic Marine Inc.
CAPRICORN (1992) The 43 foot fishing vessel Capricorn was consumed by fire and sank March 27, 2992 in Kachemak Bay. There was no loss of life. The night was dark and the wind was reported to be blowing 40 northeasterly. The Capt. Worden was valued at $1,400 at the time of the loss and had no cargo. CAPT’N ANDREW (2011) The 58 foot steel fishing vessel Capt’N Andrew ran aground at Bold Cape March 6, 2011. The fishing vessel Just In Case borrowed a skiff from the King Cove Harbormaster and rescued the five persons aboard the Capt’N Andrew. Magone Marine was contacted to perform salvage operations. CARLISLE I (1956) The 35 ton 56 foot wooden oil screw fishing vessel Carlisle I was consumed by fire April 12, 1956 at Cordova. CARMELLA J (1961) The 35 ton 44 foot wooden oil screw fishing vessel Carmella J was destroyed by a storm November 6, 1961 off of Ugak Bay. CARMEN B (1968) The oil screw Carmen B was consumed by fire October 1, 1968 at False Pass. CAROL IRENE (1969) The oil screw Carol Irene stranded and was lost May 23, 1969 at Cordova. CAROL JEAN (1980) The 107 foot fishing vessel Carol Jean burned and sank May 29, 1980 four miles off of Granite Cape while tendering herring. Her crew of three was picked up by the vessel Stardust and taken to Seward. CAROLINE (1944) The 61 ton 66 foot wooden oil screw fishing vessel Caroline stranded and was lost at Wolcott Reef, Kodiak Island August 18, 1944. The big San Juan tender was en route from Larsen Bay to Harvester Island. CAROLINE (1996) The 32 foot salmon gillnetter Caroline burned and sank July 22, 1996 in Kvichak Bay, Bristol Bay. All three crewmembers made it to safety. CAROLYN C (1973) The crab fishing vessel Carolyn C caught fire and was lost October 5, 1973 near the Pleiades Islands in Prince William Sound. Crewmembers abandoned ship and reported being attacked by sea lions and almost drowned before being rescued. CAROLYN JEAN (1985) The 98 foot trawler Carolyn Jean drug anchor and sank in shallow water October 26, 1985 in Portage Bay. The vessel was seeking shelter from 65 to 75 knot winds and 20 foot seas in the Shelikof Strait. The crew of four was rescued by U S Coast Guard Helicopter when the vessel was threatening to roll over. CASTLE CAPE (1994) The 35 foot salmon seiner Castle Cape collided with the fishing vessel Capelin in the fog, August 11, 1994 off of Elrington Island. The Castle Cape sank and her four crewmembers were rescued by the U S Coast Guard. CATHERINE (1917) The steamer Catherine was reported lost at Ugashik in 1917. Comment: See Saint Katherine, may be same wreck. CATHERINE J (1966) The 24 ton 40 foot wooden oil screw fishing vessel Catherine J foundered July 17, 1966 off of Seal Cape Light. CATHY JOY (1965) The 12 ton 29 foot wooden gas screw fishing vessel Cathy Joy was consumed by fire August 15, 1965 at Naknek. CEDAR (1965) The 32 ton 43 foot wooden oil screw fishing vessel Cedar was lost May 18, 1965 off of Kodiak. CELTIC (1968) The 65 foot wooden oil screw fishing vessel Celtic stranded and was lost November 24, 1968 at the southeast end of Spruce Island in Ouzinkie Narrows. CHABRO (1987) The 56 foot fishing vessel Chabro sank May 5, 1987 approximately 80 miles southeast of Seward. Everett Collins (59) of Soldotna was lost. Four others were rescued by the fishing vessel Kodiak. CHALLENGER (1963) The 13 ton 35 foot wooden gas screw fishing vessel Challenger foundered December 31, 1963 off of Seldovia. CHANNEL SURFER (2000) The 32 foot aluminum gillnet salmon fishing vessel Channel Surfer burned from an engine room fire and sank July 22, 2000 near Karluk in the Shelikof Strait. CHAPEASUE (1984) The 69 foot fish tender ChapeaSue sank August 20, 1984 near Hinchinbrook Entrance in the Gulf of Alaska. CHARLES E MOODY (1920) The 2003 ton wood ship Charles E Moody caught fire late in the evening June 28, 1920 at Bristol Bay, Naknek Roadstead. She had sailed from Seattle April 20th with a cannery crew of 136 fishermen and a mate, a cargo of cannery supplies, fishing boats and 200 tons of coal. She had arrived at Naknek the first week of June and all passengers debarked. The mate was alone on board the night of June 28 and had put out the anchor light around 9:00 p.m. Hours later he was hailed by a fisherman as the vessel was ablaze forward. He was taken off the Charles E Moody leaving his possessions behind. The Alaska Packers tug Kayjak and steamer Shelikof responded and pumped hoses with full force for 40 minutes but were driven off by the flames. The vessel was totally destroyed by the blaze. CHARLOTTE ANN (1959) The 15 ton 40 foot wooden oil screw fishing vessel Charlotte Ann was consumed by fire April 12, 1959 at Belkofski Bay. CHARLOTTE B (1942) The 27 ton 48 foot wooden gas screw fishing vessel Charlotte B struck a reef and foundered October 9, 1942 in Geese Island Channel. CHARLOTTE B (1979) The 80 foot crab vessel Charlotte B sank in 27 feet of water in the Kodiak Small Boat Harbor stall #148 on May 20, 1979 taking some of the dock with her. The vessel was raised June 13, 1979, taken offshore and scuttled. CHASE (1930) The 39 foot wood gas screw Chase left Kodiak on September 7, 1930 bound for Seward with a load of three tons of canned clams and coal. Neither the Chase nor her owner, captain and sole occupant, Charles Enswiler, were ever seen again. It was several weeks before the loss was realized. A search of the shoreline and seas between Kodiak and Seward was unsuccessful in locating any sign of the tragedy. It is supposed that the vessel foundered. Comment: I have mapped this wreck in the Barren Islands for lack of a better place. The waters in that area are some of the most treacherous between Kodiak and Seward for a vessel that size. Source: U S Coast Guard Casualty Report filed at Seward by business associate and part owner of lost cargo Mrs Josie Sandavik on October 29, 1931. CHEECHAKO (1998) The 36 foot longline halibut fishing vessel Cheechako was consumed by fire and sank June 4, 1998 approximately 14 nautical miles southwest of Ninilchik. CHIGNIK #1 (1908) The 70 ton wooden scow Chignik No.1 of Port Townsend Washington foundered and was lost at Cape Cleare off the south end of Montague Island on April 28, 1908. She had been built at Port Blakely, Washington earlier that year. CHIGNIK 2 (1966) The 10 ton 29 foot wooden gas screw fishing vessel Chignik 2 foundered July 31, 1966 at Warner Bay. CHIGNIK 6 (1957) The 8 ton 31 foot wooden gas screw Chignik 6 burned August 7, 1957 at Chignik Lagoon. CHIGNIK 7 (1962) The 8 ton 31 foot wooden gas screw fishing vessel Chignik 7 stranded and was lost March 27, 1962 near Ivanof Bay. CHIGNIK PRIDE (1961) The 7 ton 27 foot wooden gas screw fishing vessel Chignik Pride was consumed by fire October 3, 1961 at Chignik Lagoon. CHILKOOT (1949) The 41 ton 60 foot wooden oil screw tug and fishing vessel Chilkoot was consumed by fire at Rocky Point, Montague Island June 6, 1949. The four man crew was rescued by another tug, the New Sunrise. CHIRIKOF (1968) The oil screw crab fishing vessel Chirikof foundered February 29, 1968 off of Kodiak Island. All three crewmembers escaped to a skiff. They did not have time to grab oars and drifted until spotted the following day by the Alaska Steamship Company freighter Chena. The three men were too hypothermic to climb the Jacob’s ladder of the Chena so the U S Coast Guard was called and the cutter Confidence responded to rescue the men. CHRISTINE (1964) The 10 ton 34 foot wooden oil screw fishing vessel Christine was destroyed by a tidal wave March 27, 1964 at Valdez. CHRISTOPHER A (1998) The 30 foot gillnet salmon fishing vessel Christopher A stranded in rough weather and was lost May 18, 1998 at the mouth of the Copper River. Both crewmembers made it to safety. CIMBRIA (1984) The 50 foot crab fishing vessel Cimbria listed and sank November 30, 1984 off of Cape Trinity near Egg Island in Alitak Bay. The three crewmen aboard escaped in a life raft and were picked up by a skiff from Akhiok. CINDY (1964) The 13 ton 31 foot wooden oil screw fishing vessel Cindy was reported lost in the Good Friday earthquake of March 27, 1964 at Kodiak. CINDY (1964) The 14 ton 43 foot wooden oil screw fishing vessel Cindy stranded and was lost April 2, 1964 at Kodiak. CINDY (1964) A vessel named Cindy owned by Bill Gregorioff was reported lost at Kodiak in the Good Friday earthquake of March 27, 1964. CINDY W (1965) The 45 foot steel oil screw fishing vessel Cindy W was grounded and lost on Left Cape, Kodiak Island when a crewman fell asleep at the wheel. Attempts were made by sister vessel Bee W to pull the vessel from the beach. The bottom of the Cindy W was eventually damaged beyond repair. The hull was visible on Left Cape at the entrance to Kiliuda Bay for many decades. Comment: I have yet to find an official documentation of this loss. CITY OF SEATTLE (1979) The 84 foot crab fishing vessel City of Seattle split a seam and foundered April 7, 1979 in the Gulf of Alaska 80 miles south of Yakutat. All persons on board were picked up by the U S Coast Guard. CITY OF SEATTLE (1981) The 84 foot crab fishing vessel City of Seattle caught fire and sank September 14, 1981 in the Shelikof Strait five miles south of Cape Uganik. The six crewmen aboard were rescued by the U S Coast Guard Cutter Confidence. CLARA (1936) Escaping gas caused an explosion aboard the wooden gas screw Clara Wednesday December 16, 1936 at winter dry dock on the beach in Monti Bay at Yakutat. Owner/operator Walter Thayer valued the Clara at $500 with no insurance in the wreck report he filed at Yakutat January 22, 1937. CLARA J (1971) The oil screw Clara J was consumed by fire September 25, 1971 at Hoodoo Bay in Prince William Sound. CLARINDA (1947) The 76 ton 89 foot wooden oil screw Clarinda was consumed by fire January 12, 1947 at Sand Point. CLAUDIA C (2007) The 33 foot fishing vessel Claudia C flooded and sank six miles off of Ninilchik in Cook Inlet July 2, 2007. The fishing vessel Holly Ann attempted to assist the Claudia C in pumping out the sinking vessel but the three aboard were forced to abandon ship to the Holly Ann as the Claudia C went down. CLEVEDON (1942) The 7,314 ton Army transport passenger steamer Clevedon caught fire and was destroyed by the explosions of her cargo January 12, 1942 off of Yakutat. The vessel was hauling a cargo of ammunition when a fire broke out in her engine room. The Steamship Taku towed the burning Clevedon out of Yakutat Harbor across the bay and beached her. High tide cast the blazing vessel free and she drifted for five hours until the explosions of her cargo finally sank her. There was no loss of life. CLOVERLEAF (1980) The 60 foot wooden trawler Cloverleaf overturned and sank April 2, 1980 eight miles off of Sutwik Island near the Alaska Peninsula. The vessel had been dragging for bait for the crab fleet with three crewmen aboard. Her last transmission was a distress call received by the U S Coast Guard Air Station Kodiak. The Cloverleaf had taken a heavy roll to starboard and not recovered. The crew was abandoning ship in foul weather. Winds were reported at 65 mph and seas to 20 feet. Coast Guard aircraft and nearby vessels responded to the area but were not able to locate the Cloverleaf or her crew. The following day a crewman clinging to a log was spotted by one of two U S Coast Guard C-130 aircraft searching the area. It turned out to be Rick Laws, the captain of the vessel. The fishing vessels Bessie M and Rondys were able to retrieve Laws. He was transported to King Cove where he was picked up by a U S Coast Guard helicopter and transported to Kodiak for treatment of hypothermia. The other two crewmembers of the Cloverleaf, Kodiak fishermen Wink Cissell and Kim Hanlin, were lost. COHO (1990) The 29 foot steel longline halibut fishing vessel Coho took water over the stern while heavily loaded with fish, capsized and sank June 7, 1990 in Cook Inlet off of Dangerous Cape. COHOE (1983) The halibut schooner Cohoe flooded and sank in heavy weather April 1, 1983 approximately 20 miles northwest of Kayak Island. COLDBROOK (1942) The 5,104 ton 390 foot diesel powered steel steam ship Coldbrook was sunk by enemy action June 16, 1942 about 75 miles south of Cordova near Middleton Island. The Coldbrook was operating as a cargo steamship and was loaded with military supplies. Some reports mention the vessel was grounded on Middleton Island and salvage efforts undertaken. They were unsuccessful and the Coldbrook was abandoned. COLLETTE (1974) The 16 ton 43 foot wooden oil screw fishing vessel Collette foundered February 3, 1974 south of Spruce Cape on Kodiak Island. COLUMBIA (1909) The American wood square rigged ship Columbia stranded near Seal Cape Unimak Island at 12:30 a.m. April 30, 1909. The 1,327 ton 206 foot vessel left San Francisco April 8 bound for Bristol Bay with 170 passengers, 24 crewmen and a load of $60,000 worth of cannery supplies. J H Cameron, Master of the Columbia reported a heavy swell, no wind (she was under sail), and a snow storm caused the vessel to drift ashore in the dark. Two anchors were set out but didn’t help. The $18,000 vessel and her cargo were lost, but all those aboard were able to get to safety. COLUMBIA (1918) The 19 ton 41 foot gas screw fishing vessel Columbia foundered September 14, 1918 in Saint Matthews Bay. The 5 persons aboard made it to safety. COLUMBIA (1979) The 105 foot vessel Columbia sank at Unalaska December 18, 1979. Crewmember James Horsefield died in the disaster. COLUMBIA (1997) The 75 foot fish tender Columbia was destroyed by a fire in the engine room May 29, 1997 off of the Barren Islands. The one person aboard made it to safety. COMBINE (2003) The 41 foot longline cod fishing vessel Combine struck a pinnacle and was lost January 24, 2003 off of Popof Island approximately five miles east of Kodiak. The master of the vessel issued a May-Day at 12:17 a.m. and the U S Coast Guard issued an urgent request for assistance. A U S Coast Guard Helicopter and the fishing vessels Highliner and Currency responded. All three crewmembers from the Combine were taken aboard the fishing vessel Highliner in good condition. COMET (1959) The 41 ton 56 foot wooden oil screw Comet stranded and was lost August 31, 1959 near Kodiak. COMMANDER (1975) The gas screw Commander stranded and was lost September 1, 1975 at Chignik Lagoon. COMMANDER (1980) The 75 foot wooden trawler Commander disappeared with all hands November 21, 1980 on the way from Seattle to Kodiak with four persons on board. The vessel was last seen 30 miles off of Cape Spencer heading into 30-35 foot swells and 80 knot winds. Wreckage was spotted on the beach 27 miles south of Yakutat. Lost were four family members including Philip Edwards and his son Philip Jr., his brother John Edwards and his nephew Sam Bissett, all from Seattle. COMPEER (1912) The 347 ton 140 foot three-masted schooner Compeer wrecked at Cape Chichagof near Egegik in Bristol Bay on July 17, 1912. There were 30 persons aboard at the time of the disaster. All made it to safety. Built at Fairhaven, California in 1877, the Compeer was valued at $25,000 with cargo. CONQUEST (1994) The 58 foot fishing vessel Conquest was consumed by fire and sank near the Sand Point Boat Harbor December 9, 1994. CONSTANCE (1919) The 78 ton gas screw fishing vessel Constance stranded and was lost twenty five miles east of Cape Suckling Saturday August 23, 1919 at 2:40 a.m. The crew of fifteen made it to the beach safely and was picked up by the schooner Northland. The burden of 26,000 pounds of halibut and easterly tide currents running into shore helped cause the casualty. The Constance was valued at the time of the wreck at $16,000 and her cargo of fish $4,000 both total losses. The vessel was insured for only $10,000 and there was no cargo insurance. CONTENTMENT (2002) The 35 foot cod and crab fishing vessel Contentment struck a rock and sank at 4 a.m. February 18, 2002 approximately 40 miles south of King Cove. Both crew members were rescued by the fishing vessel Coastal Pilot and taken to Dutch Harbor. CONTROLLER BAY (1999) The 78 foot steel fishing vessel Controller Bay grounded and was lost May 8, 1999 in the vicinity of Cave Point, Cape Mordvinof, Unimak Island. The vessel had been pot fishing for Pacific Cod. The master fell asleep at the wheel with the autopilot on, causing the disaster. High winds and heavy seas broke up the Controller Bay on the rocks. All four crewmembers abandoned ship in survival suits to a life raft and were rescued by the fishing vessel Shaman. COOK INLET (1945) The 30 ton 48 foot wooden oil screw Cook Inlet foundered January 31, 1945 near Afognak Village in Afognak Bay. COPPER (1950) The 7 ton 32 foot wooden gas screw fishing vessel Copper burned at the dock in Seldovia on November 17, 1950. CORA B (1978) The charter boat Cora B struck a rock flooded and was towed to Bass Harbor on Naked Island November 7, 1978. There she was stripped and burned. The vessel had been used at times by the U S Bureau of Mines and the U S Forest Service. CORAL (1997) The 43 foot longline fishing vessel Coral grounded and sank March 23, 1997 in Resurrection Bay. Both crewmembers made it to safety. CORAL MASTER (1976) The 78 foot vessel Coral Master sank in October of 1976. CORDOVA (1966) The 55 ton 79 foot wooden oil screw fishing vessel Cordova burned June 6, 1966 in the Copper River Flats near Cordova. CORDOVA (1995) The 82 foot wooden crab fishing vessel Cordova flooded and sank May 5, 1995 approximately 85 miles north of Cold Bay in the Bering Sea. The vessel was on her way to the herring opening in Togiak when she began taking on water from the bow. After multiple attempts to dewater the Cordova, all four crewmembers abandoned ship in survival suits to a life raft and were rescued by the fishing vessel Lady Kodiak. During the process of abandoning ship it was observed that about six feet of anchor chain was out. It was speculated that the anchor had slipped its dogs allowing it to punch through the bow and flood the vessel. CORDOVA SALVOR (1957) The 180 ton 100 foot steel oil screw Cordova Salvor stranded and was lost November 4, 1957 at Cape Sarichef. There were 97 passengers and 19 crewmen aboard the Corea at the time of the casualty, all of whom were saved. The $45,000 cargo of 500 tons of cannery materials and merchandise was 80 percent lost. The Corea, valued at $15,000 is listed as a total loss. CORSAIR (1912) The 15.74 ton 54 foot wooden gas screw steamer Corsair stranded at Point Martin near Katalla at 2:00 a.m. October 29, 1912 carrying 14 tons of general ware cargo. She soon caught fire and was destroyed. Of the two aboard, only her master Peter Dahl of Katalla survived. Engineer Albert Ness was lost. Conditions at the time of the casualty were high seas and 70 to 80 mile an hour winds. The Corsair is reported to have been “engaged in lengthening off steam”. CORY B (2005) The 32 foot gillnet fishing vessel Cory B disappeared and was presumed to have foundered around August 28, 2005 near Coffee Point en route to Naknek in Bristol Bay. Debris from the vessel was spotted two to four miles north of Coffee Point after a storm washed through the area. Myron J Rapacz, skipper of the Cory B and the only one on board, was lost with the vessel. Rapacz was believed to have been fishing near Cinder River, was returning to Naknek and was caught in the storm. COUGAR (1946) The 43 ton 59 foot wooden gas screw fishing vessel Cougar foundered July 22, 1946 four miles off Rocky Point in the Shelikof Strait. She had departed Karluk with 20,000 fish bound for Kodiak. The vessel took on water in the engine room, split open and sank stern first. Three crewmembers and seven passengers were lost with the vessel including captain Irving Glen Palmer of Tacoma WA, deckhand Ray Lawson of Aberdeen WA, engineer A G Sturman of Bellingham WA, Lois Mueller of Denver CO and the Alaska Native Service, Lorraine Habch, Mrs. Amund Taylor (on her way to have a child), Lester Knagin and Willie Roft. Names of three others lost were not known including a waitress from Carmel, a man from Carmel and a commercial fisherman. Harold Aga of Larson Bay survived 11 hours clinging to a gas tank. He was rescued by a passing fishing vessel, taken to a nearby cannery and flown to the hospital in Kodiak. The wreck is reported to have been caused by “Iron about the compass”. Other reports mention that Amak Island was mistaken for Akun Island while the crew was dead reckoning in the fog because of the faulty compass. COWBOY (1981) The fishing vessel Cowboy was lost in rough weather August 20, 1981 in the Gulf of Alaska. CRAIG FOSS (1965) The 179 ton 88 foot steel oil screw tug Craig Foss foundered November 7, 1965 in Cook Inlet. All 10 crewmembers were rescued. CRANE (1939) The 10 ton 34 foot wooden gas screw fishing vessel Crane stranded and was lost October 12, 1939 at Valdez. No one was aboard at the time of the casualty. CRESSET (1952) The 36 ton 53 foot wooden oil screw fishing vessel Cresset foundered January 17, 1952 in a storm at Kodiak. CREST (1964) The 13 ton 36 foot wooden gas screw fishing vessel Crest was destroyed by a tidal wave March 27, 1964 at Seward. CROW (1978) The 117 foot old Navy landing craft Crow sank 9 miles off of Wide Bay November 20, 1978. The vessel was transporting construction materials to a cannery. The six crewmen aboard were rescued from a life raft by the U S Coast Guard. CRUISER (1991) The 32 foot long line fishing vessel Cruiser burned and sank September 20, 1991 off of Marmot Island near Kodiak. The one person aboard was rescued. CRUSADER (1943) The 101 ton 73 foot wooden oil screw fishing vessel Crusader foundered May 1, 1943 in the Shumagin Islands. CRY HAVOC (1997) The 32 foot salmon seiner Cry Havoc grounded and was lost August 24, 1997 at Ugashik. No one was on board at the time of the disaster. CURLEW (1984) The 48 foot wooden fishing vessel Curlew stranded and foundered September 30, 1984 near Herendeen Island in the Shumagin Islands. The Curlew was towing the Kelly Ann who had been experiencing engine trouble southeast of Atkin Island. Three of the four crewmen aboard the Curlew were lost including David Miller, Phil O’Donohue and Geoff William O’Donohue. Ray Miller, the fourth crewmen from the Curlew, managed to get aboard the Kelly Ann to safety. CURLEW (1990) The 33 foot wooden fish tender Curlew capsized and sank in rough weather October 1, 1990 off the Barren Islands. Both crewmembers were rescued. CYCLONE (2012) The fishing vessel Cyclone sank six nautical miles east of Cape Chiniak March 2, 2012. All three crewmembers abandoned ship in survival suits and were rescued by Good Samaritan fishing vessel Glacier. The Glacier was in the area and responded to the U S Coast Guard Urgent Marine Information Broadcast. Weather was reported to include winds southwest 25 knots and seas 8-10 feet. The Cyclone flooded from the lazarette. CYGNET (1995) The 72 foot steel fishing vessel Cygnet flooded and sank November 17, 1995 off of Flat Island in Cook Inlet. The two persons aboard made it to safety. CZARINA (1911) The 116 foot wood schooner Czarina stranded in a gale in the E side of Nagai Island and was lost at 10:00 p.m. February 15, 1911. The vessel had a crew of ten aboard all who survived the casualty. The Czarina, valued at $10,000 and her 300 ton cargo of salt and provisions worth $8,000 were lost. Captain William Wallstedt of Oakland California stated that he was seeking shelter from the weather. My grandfather sailed on this ship in 1901-1902 when he was about 12. His father was a lawyer for the Alaska Packing Co. and thought a stretch of real work would be good for him. He never lost his love for these old sailing vessels and recreated them in beautifully crafted models. I have one which is in need of restoration of the rigging which time has not been kind to. I also have a diary which he kept while aboard the Czarina. What treasures you have. I would love to read the dairy. 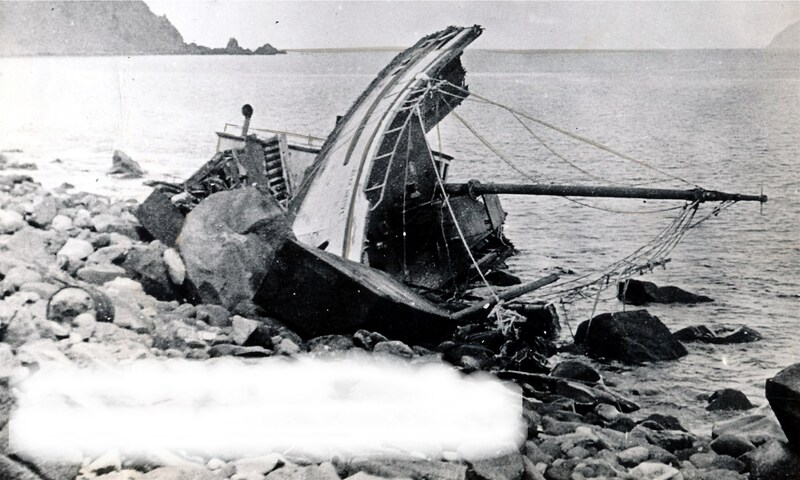 I think your Grandfather may have been aboard when the Czarina ran up on the rocks in the Pribilof Islands January 18, 1902 and did a great deal of damage to her hull. That is not a place where many survive stranding that time of year. I was a crabber in the Bering Sea during the 1970’s and 1980’s and know how bone chilling the weather there is. What size is the model?